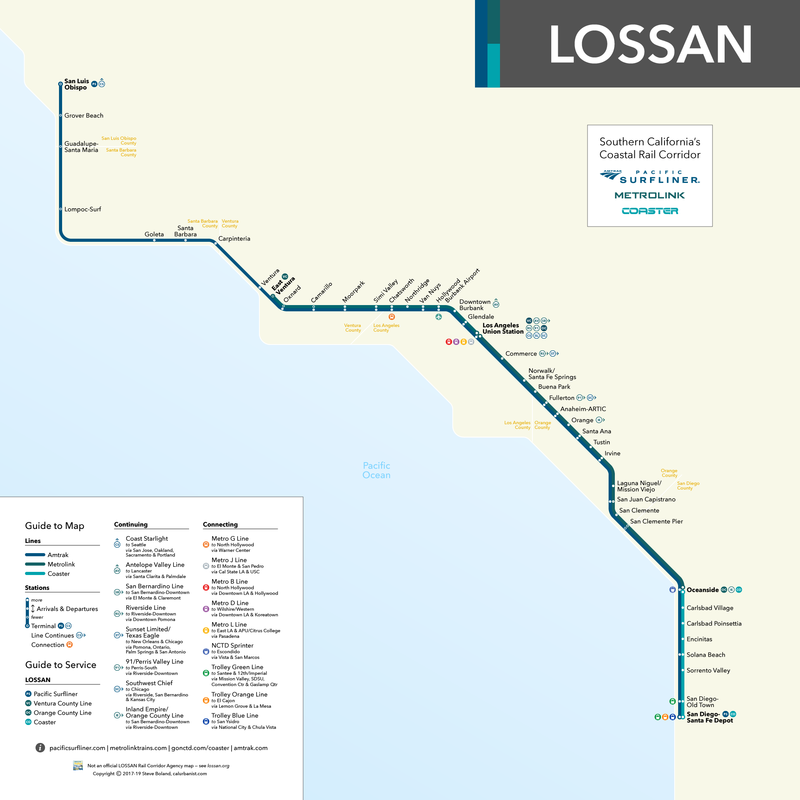 LOSSAN is the Northeast Corridor of the West Coast, served by Amtrak’s Pacific Surfliner and long-distance trains to Seattle, Chicago and New Orleans as well as by L.A. and San Diego-area commuter rail. The Surfliner, which runs the length of the corridor from the Central Coast through L.A. to San Diego (350 miles, which takes eight-and-a-half to nine hours — this is not high-speed rail), is Amtrak’s third-busiest line after the Northeast Regional and Acela. It is also one of its most scenic. With the notable exception of Cameron Booth’s Amtrak Subway Map, stylized diagrams of Amtrak lines are strangely hard to find. Metrolink, meanwhile, is the rare commuter rail system with a stylish diagrammatic map. This map is the color of sand; the typeface is Adrian Frutiger’s Avenir Next, an update of the font used by the French national rail operator, SNCF (as well as Apple Maps and Dwell magazine).